TROPICAL OCEAN VIEW ESTATE. 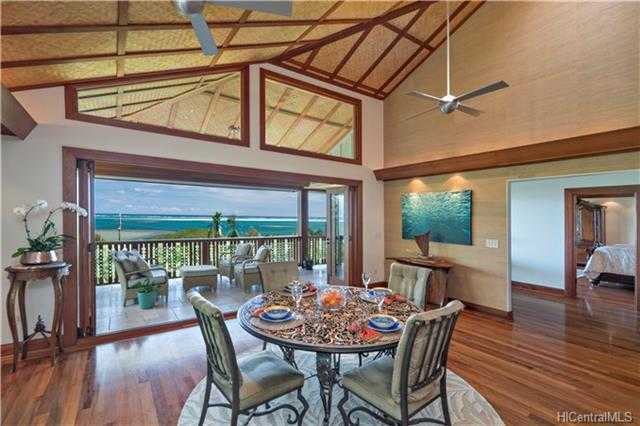 Exquisite home perched on over 1.5 acres of lush gated hillside overlooking beautiful Kaneohe Bay. Meticulously remodeled with gorgeous Ohia and tumbled travertine floors, mahogany accents, gourmet kitchen w/high-end appliances and unique aquamarine granite. This lovely Philpotts designed interior captures the essence of island living. Home has a 2-bedroom guest suite w/wet bar on the 1st level, a four-car garage, tatami room w/ocean views for meditation/yoga, a Japanese soaking tub in the master bathroom, large screened in lanais on both sides of the house, and a level grassy yard with fire pot for enjoying evenings under the stars. This comfortable home is a quiet and private retreat in a lush and tropical setting only 25 minutes from Honolulu Int’l Airport. Please, send me more information on this property: MLS# 201807211 – $1,999,999 – 47-422 Lulani Street, Kaneohe, HI 96744. I would like to schedule a showing appointment for this property: MLS# 201807211 – $1,999,999 – 47-422 Lulani Street, Kaneohe, HI 96744.